Polaris is a bright star that is close to the north celestial pole. Currently, Polaris is only 0.74° apart from the north celestial pole and the only star visible to the naked eye that is close to the celestial pole. 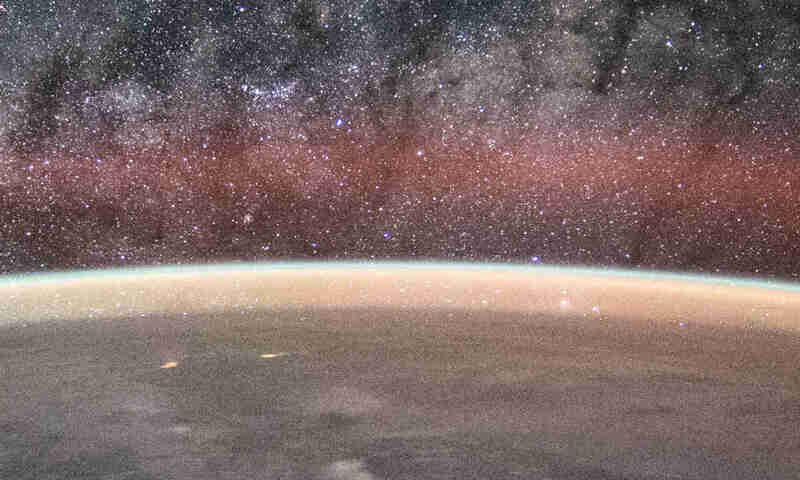 This is why Polaris is popular as a navigational aid in the northern hemisphere. 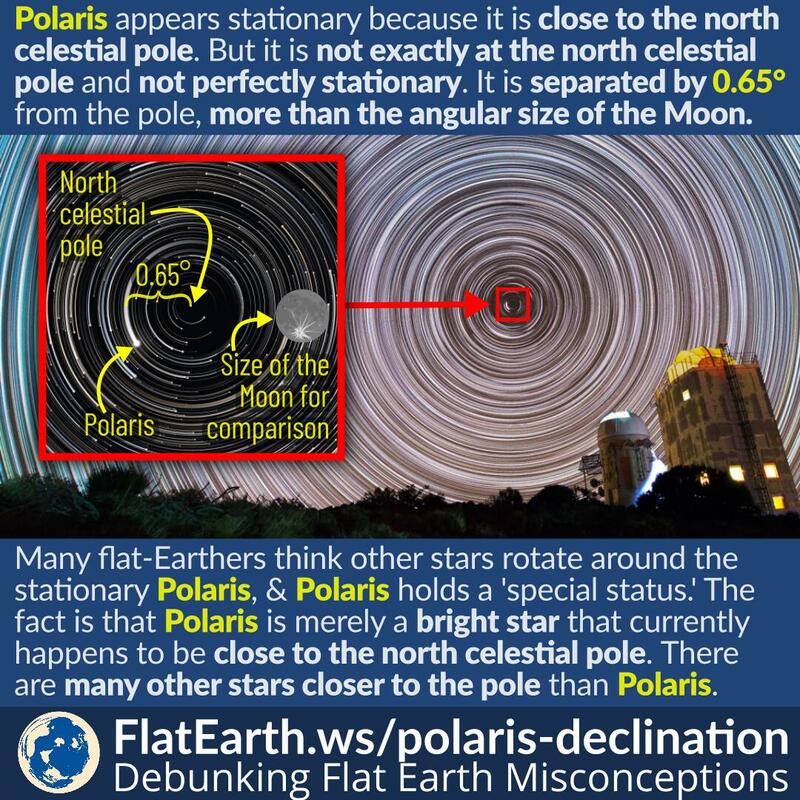 Some flat-Earthers think that Polaris is stationary and that it is a ‘special star’ because other stars are in motion around it. They would take that as ‘evidence’ that the Earth is motionless. They are wrong. Polaris is merely a regular star, just like the others. Polaris has a declination of 89°15’50.8″ (89.26411°), or in other words, it is about 0.74° apart from the north celestial pole. Therefore, Polaris appears to be in motion around the north celestial pole with the radius of about 0.74°. For comparison, the angular size of the Moon is about 0.52°, and hence, the declination of Polaris is larger than the Moon’s angular size. In the majority of star trail pictures, the motion of Polaris around the north celestial pole is not apparent. The reason is that such photos are usually taken using wide-angle lenses, and the small declination of Polaris is not easy to notice. The motion of Polaris can be easily seen when a star-trail picture is taken using a telephoto lens. There are many other stars closer to the north celestial pole than Polaris. The Simbad database currently lists 131 of such stars. The advantage of Polaris from the rest is that it is much brighter than the other stars, and easily seen using the naked eye. The position of Polaris relative to the north celestial pole is also not always like we are seeing. The Earth’s axial precession and Polaris’ proper motion are the most significant influences. In 2100, Polaris is going to be at the nearest point to the north celestial pole, with the declination of 89°32’23”. Afterward, Polaris will move away, and in time, another bright star will take its place as the north star. Unlike what flat-Earthers are assuming, Polaris is not unique and is simply another star. It happens to be a bright star closest to the north celestial pole in our lifetime.